Gardening can help families and individuals in many ways. In uncertain economic times, gardens can be used to supplement the family food budget, as well as provide fresher, healthier food for the table. Gardens can help families to connect- gardening with your children creates bonding experiences that will educate and entertain. It instills in them knowledge of our natural world they will carry for a lifetime. Gardens can be an escape from the everyday rat-race. Whether you spend time daily weeding, tending, or just enjoying the beauty of the flowers, time spent in the garden every day will help relieve stress and worry. Gardening is an endless classroom for all, young and old. Learning about different plants, trying new varieties, seeing what works and what doesn’t, and watching the garden grow from the anticipation of March and April, through the heat of August, until the final harvest in late September, the garden is an open text book and an ever changing canvas for you to enjoy. There is self-satisfaction in knowing that the produce you grow was created by your own efforts, grown organically if you wish, and not shipped hundreds or thousands of miles before it graced your dining table. Even if you live in an apartment, we will show you how to grow small amounts of vegetables, care for indoor plants, or create a small but enjoyable flower display. While the focus of our advice is gardening in the Mid-Western United States, the basic principles put forth here will work anywhere. Soil improvement works for every gardener. Composting can be done in any scale from a small vermiculture project to large community projects. Vegetables can be grown hydroponically, vertically, horizontally and decoratively. Flowers and herbs can be grown in formal arrangements, islands, beds and boxes, or however you wish. Here's something new from our website! We've recently added a new page or updated an existing one. We thought you'd like to know. Advice for beginning gardeners to get growing right! Bulb Gardening, planting flower bulbs for a spectacular spring start to your garden! Using deer resistant plants and bulbs will help protect your valuable landscaping investment. Early Spring Flowers bring color when we need it most after a long winter! Butterfly gardening is a great way to bring hours of enjoyment to you and your family. Butterfly nectar plants - Attract bunches of beautiful butterflies! Butterfly nectar plants - Attract swarms of beautiful butterflies to your garden! Hummingbirds are the acrobats of the bird world and are entertaining to watch. Container gardening is a great way to garden if you have limited space. Container gardening is a great way to garden if you have limited space or to make your landscape more dynamic. Hanging baskets are a popular method to add interest and gardening space. Potting soil or potting mix, which to use? Community Supported Agriculture may be an idea whose time has come. Put the magic of compost to work in your garden! Gardening doesn't end on labor day. Properly planned Fall gardens extend your garden season. What is the difference between annuals and perennials anyway? There are many gardening accessories that you can use to personalize your garden. Adding a garden arbor to your garden can create an elegant entryway. A Birdbath can add an interesting focal point to your garden. A Birdbath can add an interesting focal point to your garden while providing birds and butterflies with a convenient water source. A pergola becomes another room for relaxing or entertaining. A pergola can add a touch of class to any garden. It becomes another room for relaxing or entertaining. Here are some nice sundials that we've found for you. Gardening tips that will help you have your best garden ever! A quick recap of chainsaw safety tips to avoid injuring yourself. Gardening with kids grows memories that will last a lifetime! A selection of childrens gardening books to help you introduce the joys of gardening to your children. These fun vegetables will help you and your child grow a garden that's entertaining and educating. You can use a groundcover to take care of that shady area. You can use a groundcover to take care of that shady area that is hard to grow other plants in. Herbs can bring you fresh, delicious flavoring for your favorite recipes! You can bring nauture indoors with indoor gardening. From the window sill pot to an advanced hydroponics system there is something for everyone to enjoy. Houseplants add another dimension to your gardening experience, brightening the indoors. Using landscape gardening to beautify your property and increase the value of your home. Hostas are versatile plants that can be used in any landscape. Mulch can help you maintain and beautify your garden and save you time and labor! Use the No Dig Gardening method to reduce your work and increase your yields! Compost tea is an easy way to deliver nutrients to your plants. 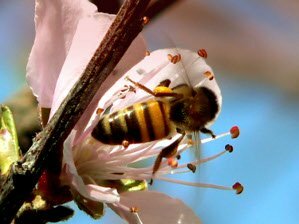 Pollinators are an important part of your garden's ecosystem. Our Rain Barrel Construction project and tips for making your own. Here's a list of seed companies for you to visit. All plants need som sunlight, choosing the right ones for your garden's conditions is easy! Temperature is an important thing for gardeners to know and be aware of all year long. Trees add beauty and value to your home landscape. They can help reduce energy costs and provide food for your family. Growing your own vegetables lets you bring the freshest, healthiest produce directly to your family! Growing your own garlic is easier than you think! Tomatoes are easy and fun to grow! Water gardening adds a new dimension to your backyard habitat! A garden fish pond can add an interesting focal point to your landcaping plans. Add a waterfall to your garden, with or without a pond and enjoy the serene peace that comes from listening to falling water. The winter garden, it's not as bleak as it seems. Spinach is easy to grow and good for you too! A christmas staple, the Poinsettia is a beautiful addition to your holiday decorations. Tulips are some of the first flowers to bloom in the spring. Forcing bulbs such as Tulips can be a quick and easy way to bring color to your home in late winter. African violets are a common houseplant that is relatively inexpensive to buy and easy to care for. Crotons are a diverse family of plants that have something for everyone. Winter houseplant care changes from the summertime routine. Tomato grafting can give you the best of both worlds, heirloom taste and hybrid vigor and disease resistance.